Secretary of the Navy Adolph Edward Borie. Adolph Edward Borie was born at Philadelphia 25 November 1809. In 1825, he was graduated from the University of Pennsylvania. After touring Europe, he joined the family business importing tea and silk from the orient. In politics, Borie was initially a Whig who favored protectionist trade policies; he later became a Republican. He was a founding member and one-time president of Philadelphia’s Union Club, and guided the recruiting and equiping of several Union regiments during the Civil War. In 1843, he was appointed Consul General to Belgium. 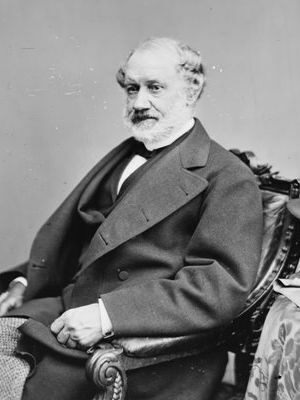 From 1848 to 1860, he was President of the Bank of Commerce in Philadelphia. Later in his business career, he took interest in railroads and financial concerns. He was also a noted patron of the arts. On 5 March 1869, President Ulysses S. Grant, said to be a card-playing acquaintance, appointed him 25th Secretary of the Navy. Due to ill health, he resigned only three and a half months later on 22 June, but after recovering, resumed service in the Grant administration (1869–77) as an advisor. In 1878–79, following President Grant’s second term, he accompanied his friend on a world tour. Secretary Borie died at his Philadelphia home 5 February 1880. Parkin, Robert Sinclair, Blood on the Sea, American destroyers lost in World war II, 1996, Sarpedon, New York, page 177.